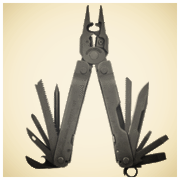 -Various important tools in a backpack - robust and cost effective. Austin Powder Pocket Blaster EBM 05. The pocket blaster works with a standard 9 V battery and can initiate up to 30 ignition caps of class I (4 mJ) or 20 caps of class II (16 mJ). 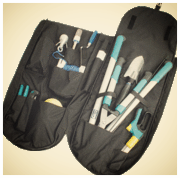 This sophisticated kit comes with several self-gripping tools for more advanced applications. The suction pads are very helpful when working on plane surfaces like metal or glass (e.g. cars, trucks, doors, windows). Included is a robust case and two 120 m Kevlar ropes on metal reels.